← When life gives you eggs… bake. This thing has been in the works for weeks. We need a moveable coop because 26 chickens can ruin a patch of ground permanently in under 6 months. And that’s after it starts stinking. So – the new coop progresses! This isn’t the most recent stage; I just need to take pictures. The whole thing, when finished, will be just under 280 square feet. It’s designed to be hauled around by the tractor; it’s a bit heavy to pull by hand, especially when the fencing is all attached. The coop will attach to one end, and there will be a little hen-breezeway between the coop and the tractor. With the coop, the birds will have over 300 square feet of space. A hawk came and got one during Thanksgiving… so we are motivated to Get It Done!! 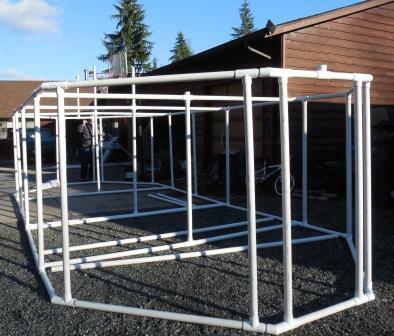 This entry was posted in Pastured Poultry, Projects and tagged big chicken coop, chicken tractor, chicken tractors, chickens, coop, large chicken tractor, large moveable coop, pastured chickens. Bookmark the permalink.